Bök’s book has become a crucial text in the history of conceptual poetry, and so its uses of images are particularly significant. Most of the book is an outlier in this project because the imagery in it is mainly typographically manipulated text (“concrete poetry”), which is not my subject here. 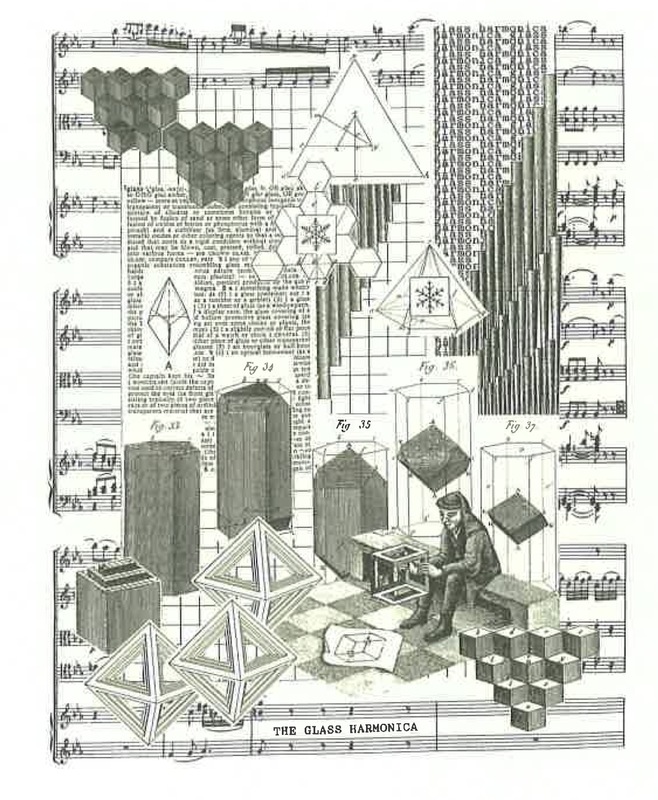 But the book also has several kinds of interpolated images—a frontispiece, several images from mineralogy treatises, and manipulated charts and diagrams—and they work in exemplary ways with the poems themselves. Most of this essay is on Crystallography; at the bottom I have added remarks on The Xenotext, vol. 1. From an art historical or art critical point of view, it’s a bad sign that the book begins with a page-long quotation from Escher, who has invariably been a symptom of a certain misunderstanding of modernisms and postmodernisms. Escher is popular with chemists—he still appears in introductory textbooks, which is appropriate for this book—but not with people engaged with current possibilities of the image. From an expressive standpoint, the epigraph signals the likelihood that Bök will be engrossed in structural games, and that those games and rules might owe more to Escher’s kind of compulsive mathematized imagination than to concerns that stem from Oulipo or conceptual poetry. The frontispiece (so Bök calls it on the last page of the book) also has a faux-medieval figure from Escher. The rest of it is a collage of crystals mainly cut from various standard sources on crystallography. The background, Bök informs us, is a page from a composition by Mozart for glass harmonica. As a graphic, the frontispiece is poorly constructed. The objects are scattered in a haphazard and unconvincing manner: they are neither symmetrically deployed (as in traditional frontispieces), tightly arranged (as in Ernst), or intentionally scattered (as in Höch, for example). An assiduous reader looking for parallels with the text—which is the normative way of reading a frontispiece—will find some echoes of Haüy and others, but the composition’s looseness is a signal to the reader that this isn’t an image requiring careful viewing. Given the structural obsessiveness of much of Crystallography, this seems like a missed opportunity, as if he didn’t think the image could serve as a recurring point of reference for the text. I come at this book with some knowledge of crystallography: I know Haüy, Bravais, birefringence, crystal classes, Miller indices. I’m aware that bringing a specialized knowledge to a book that does not demand that knowledge of its readers is risky and usually irrelevant. (I’m also aware that the book isn’t about crystallography.) But this knowledge does yield several things that are pertinent to a general reading. (a) I can see how, in some sections, Bök is trying to find verbal equivalents to crystallographic facts, and fails. The way he fails is significant. In the poem “Birefringence,” he tries to conjure interference colors by comparing them to stained glass, “gasoline rainbows,” “iridescent / insects,” and several other things. The result, for someone who knows the colors, is insufficient; and for someone who doesn’t, the result is scattered in an illegible fashion: that is, the illegibility appears to be rule-driven and its obscurity related to language games, but actually it is caused by limitations in the author’s descriptive power. (b) In the poem on Miller, Bök makes what I experience as a half-hearted attempt to conjure Miller indices (comparing them to the Dewey decimal system): what matters is that I can see this is half-hearted, because of the impossibility of conjuring something like Miller’s system: Bök knows the attempt is tepid, but that he doesn’t need to be more precise because his readers will not judge that aspect of the book—but poems like the one on Miller demonstrate how loosely he regards his crystallographic master metaphor: a looseness that is not at all projected by the book. I wonder if the book could have been even stronger if he had found a way to signal the looseness of his attachment to his non-poetic sources. (c) Specialist knowledge is also pertinent because the book’s appeal should not, even from Bök’s point of view, depend on the hundreds of polysyllabic technical terms: their exoticism and opacity can’t be the central strength or indispensable strategy of the book. When those terms aren’t opaque (for readers who know some crystallography), they reveal themselves more clearly as inexact references chosen in accord with very loose criteria: they are used to suggest global parallels with some poetics, or to provide Greek- or Latin-sounding obstructions to the text. (d) There is a similarity between Bök’s taste in crystallographic illustration and mine. When I first read this book I suspected he had taken two illustrations from a book of mine, The Domain of Images, which has a chapter of crystallography, which is also, like this book, one of the few texts on crystallography that is not intended as a contribution to science. (The chapter in my book tries to imagine the entire traditional history of art, with its styles and schools, told using only the example of crystals. It is also a “pataphysics” of crystallography, but one where the poetics is bent again, back toward a nonfictional purpose.) Bök reproduces two very obscure images I also have in my book on pp. 119 and 129—the Haüy and the Laue reproduced below. 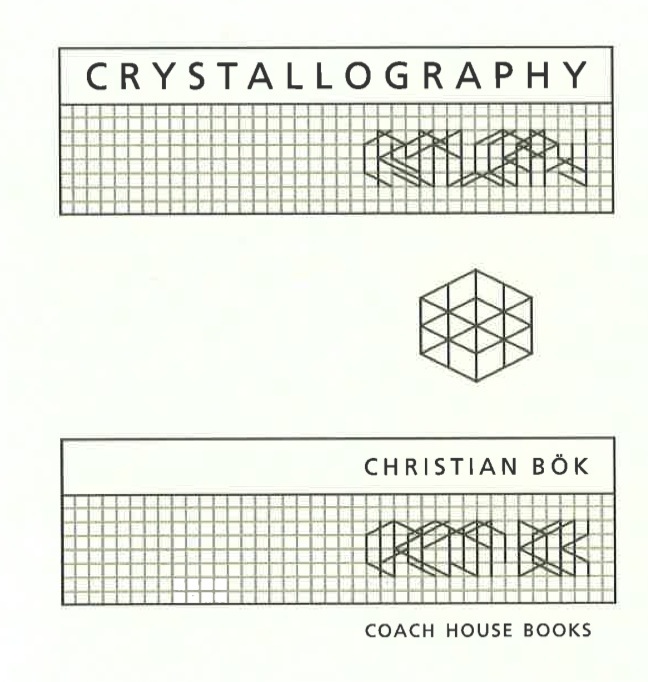 But Bök’s book was published in 1994, before mine, so it’s evidence of a similar sense of what counts as an interesting crystallographic image. (e) There is a question of the place of crystallography in Crystallography, and even though it also isn’t my subject here, it’s worth considering briefly. 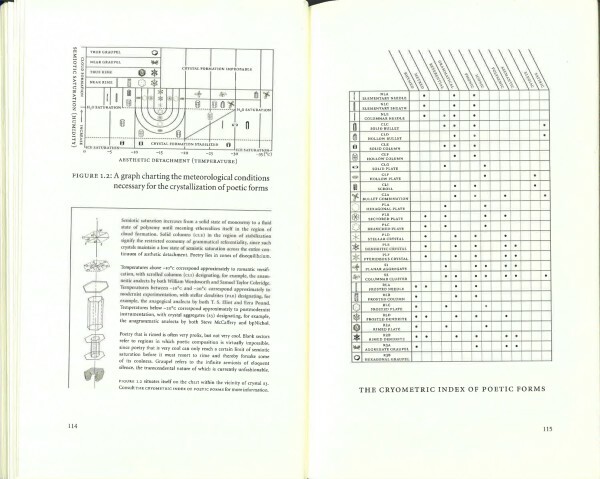 Bök’s dissertation (York University, 1998), published by Northwestern (2001), is intended as a “primer” for current and future poetic practice, and especially his own “‘pataphysical encyclopedia,” Cristallography. In the dissertation he says that Crystallography “uses the language of geological science to misread the poetics of rhetorical language.” (I haven’t checked the book to see if the wording is the same there. Crystallography itself has this variant: “Crystallography is a pataphysical encyclopaedia that misreads the language of poetics through the conceits of geology.” The word “conceits” certainly furthers the claim, in the dissertation, that science is now in process of “vanishing” or appearing “magical.”) But this claim regarding misreading can only make sense in a “‘pataphysical” context: in effect, the crystallography in Crystallography does not “misread” poetics: it infiltrates poetics, or parasitizes poetics, or substitutes illicitly for poetics. The hope of the book would be that poetics becomes strange when this personal, selective, allusive, misrepresented crystallography becomes its language, and the fear of the book might be that crystallography performs only a superficial and ornamental surrealism or formalism, and leaves poetics intact. I mention this misgiving because it bears on how the images work: they do not “misread” concrete poetry and illustration: they are instances of both, but with unfamiliar subject matter. 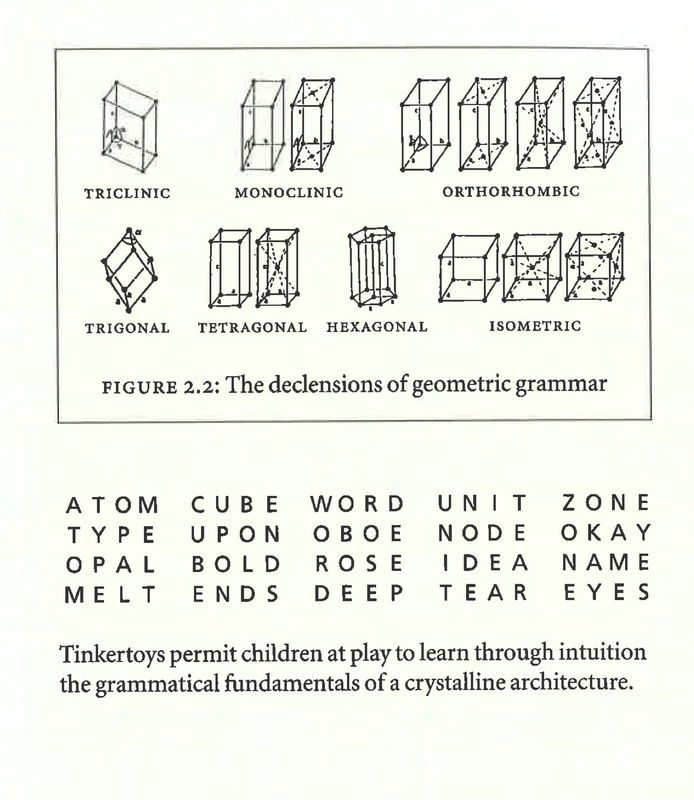 Most of what is visual in Crystallography is nominally concrete poetry: typographical arrangements intended to convey meaning. 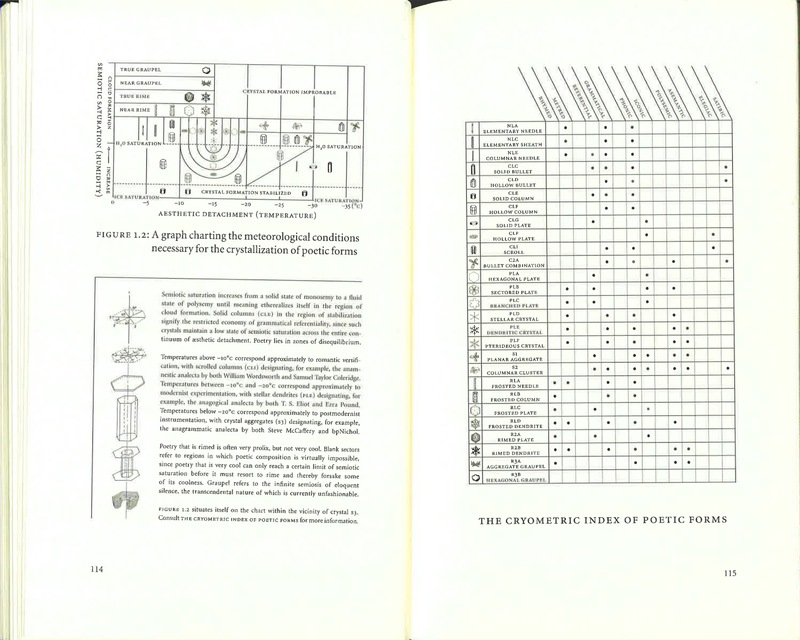 Some pages are representational (the words arrange themselves into patterns, such as molecular models) and others are formal and abstract (words are arranged into columns and other patterns). Only a few pages in the book have inserted images. The poem “AUGUSTE BRAVAIS (1811-1863)” has an illustration of the Bravais lattices, as they are called, with the caption changed to give the lattices a poetic meaning. The poem “RENÉ JUST-HAÜY (1743-1822)” has a detail from an illustration from Haüy’s treatise, with added text on the right and an altered caption. These examples show how little of the visual meaning of the originals remains. 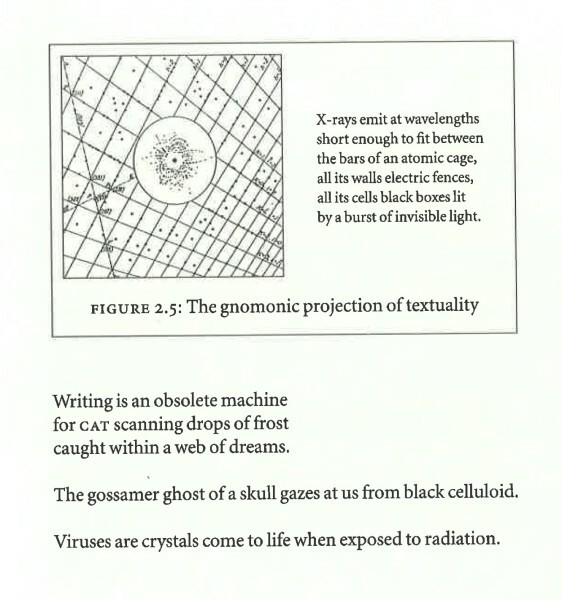 I wonder if it might have been possible to respond to more of the crystals’ properties, as they are exposited by Haüy Laue, Bravais, and others, and bring those meanings into the poem. As they are, these pictures are not much more than linear patterns, formal elements that could just as well have come from other sources. It happens Bök took his images from treatises written by the people he names, but he didn’t need to. 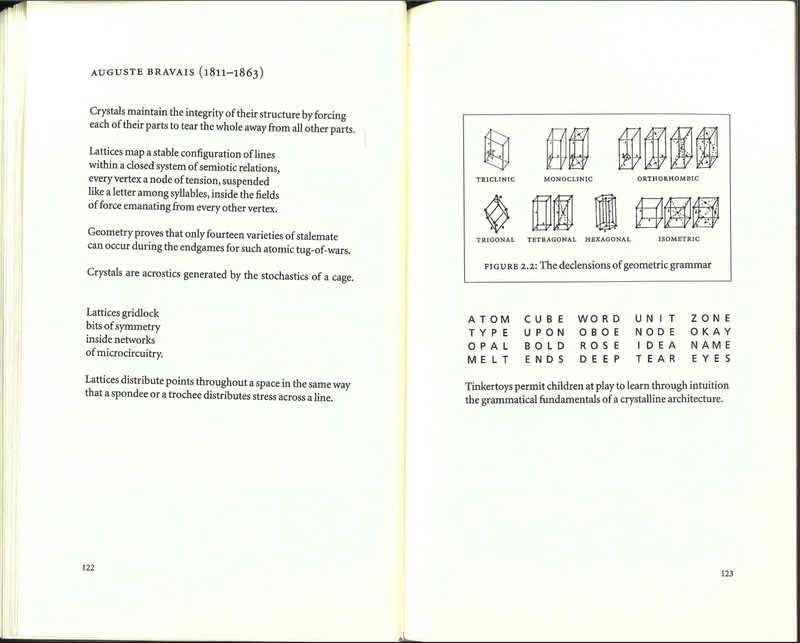 The selective, generalized elements of crystallography that find their ways into the poems on Haüy, Bravais, Laue, and others are compatible with any number of illustrations from many sources—or Bök could have drawn his own. But conversely, the concepts from mineralogy that are in the text are themselves more detailed than anything that can be gleaned from the illustrations. Pictures here are tokens, which is a pity in a poem that presents itself as saturated with surprising “pataphysical” uses of science. 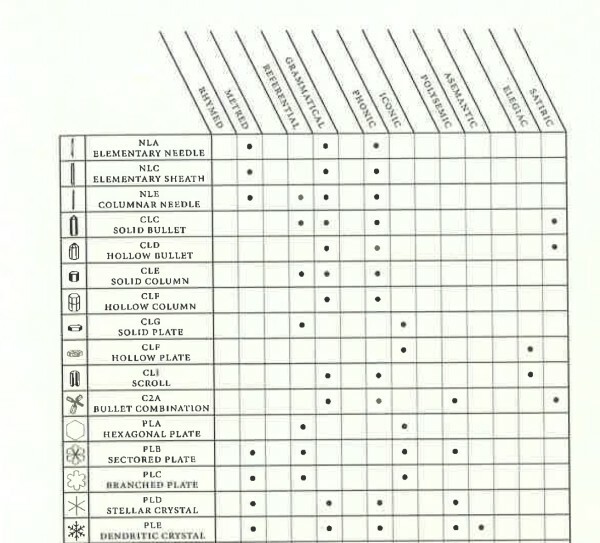 The closest Bök comes to making use of the forms, details, and meanings of his images is in the modified tables that occur several places in the book. These graphics have a level of detail that is missing from the other illustrations, but they aren’t really readable—we aren’t asked to read these charts to produce an actual poetics, although that is an intriguing possibility. Instead the charts give a sense of what might be possible, of complexities we aren’t given. From the perspective of this project it would be interesting to know why it wouldn’t be interesting, in a project like this, to construct a chart or other complex graphic that could actually invite readers to read it, and even to put its categories to work in interpreting the poem. There is one section of the book, “Diamonds” (p. 64), that is self-contained and different from the rest of the book. “Diamonds” is presented as a narrative about the author’s father, a diamond cutter. It is affective, direct, and minimally scientifically. It isn’t a flaw, in a book about flaws, to have a section that’s separate: but it is problematic to have that difference consist in directly emotional and even confessional prose, and to have that direct appeal to feeling be tied to a dilution of the scientific poetics, because that means the other sections—most of the book—then seem to require science in order not to speak directly about emotions, and that, I think, is not Bök’s intention. In my reading the most effective concrete poetry in the book comes in the section “diamonds,” because there the poetry separates into hard little blocks, which are consistently affecting because of the emotional burden they bear. It’s as if the memory of the narrator’s father’s life is shattered into the fragments made of the same substance he worked with. 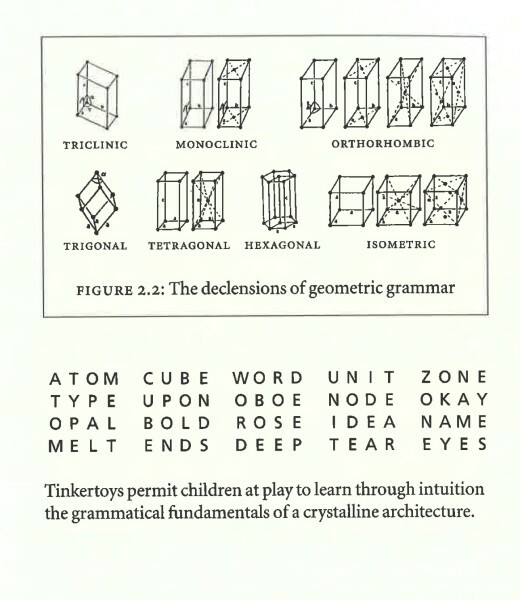 These rectilinear (crystalline, and technically cubic) blocks of text are not individually symbolic, like the concrete poetry in the rest of the book: they are therefore free to be much more affecting. As in Eunoia, the rule-bound construction of the book is continuously undermined by clearly aesthetic choices, freely made, which are themselves almost always the result of specific late-romantic and modernist allegiances. Sometimes Bök sounds like Celan (“Bleeding away / ages of images,” p. 30), sometimes Bachelard (“A crystal is the flashpoint of a dream intense / enough to purge the eye of its infection, sight,” p. 37), sometimes A.R. 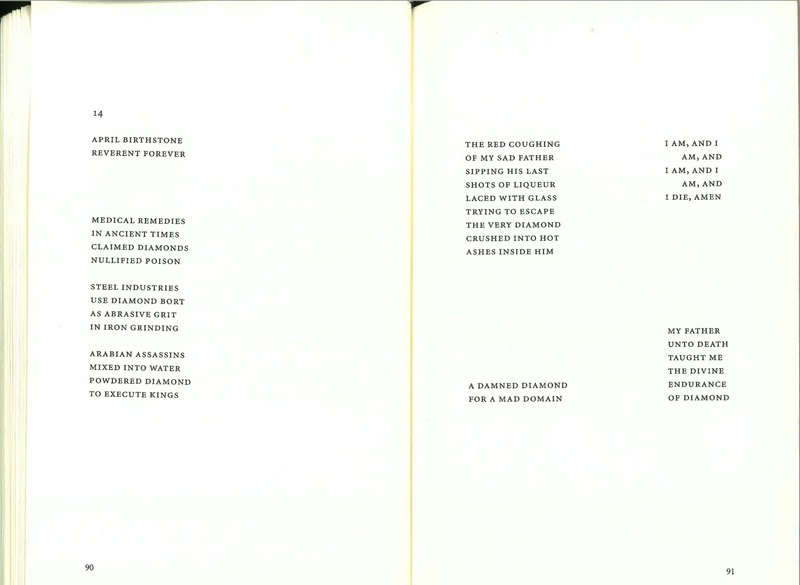 Ammons or his admirer the chemist Roald Hoffmann (“A word (like love) has a high refractive index,” p. 37). Much of this material is late romantic, including typical romantic natural science interests like abyssal creatures and invertebrates (“lammelibranchs, coelenterates. / the lost animalculae from alien seas” (p. 47). The specter of Escher returns whenever the rules appear to be constructed by the author in order to articulate his own repetition compulsions: “any path that you take / breaks from its route / in the way that a root / word, when said, gets / tangled in its ganglia” (p. 44). This is rum poetry, driven by a nearly autistic sort of compulsion, much like the long lists of supposedly similar things in Roussel’s “New Impressions of Africa.” All these non-rule-bound emulations and aesthetic choices distract from the book’s rule-bound, self-proclaimed metaphoric purpose. As in “Eunoia,” I wish he had either presented these as also rule-bound (“I choose Celan because he is the poet of the crystal fragment,” etc.) or purged them from the text in favor of echoes and allusions that remain illegible. 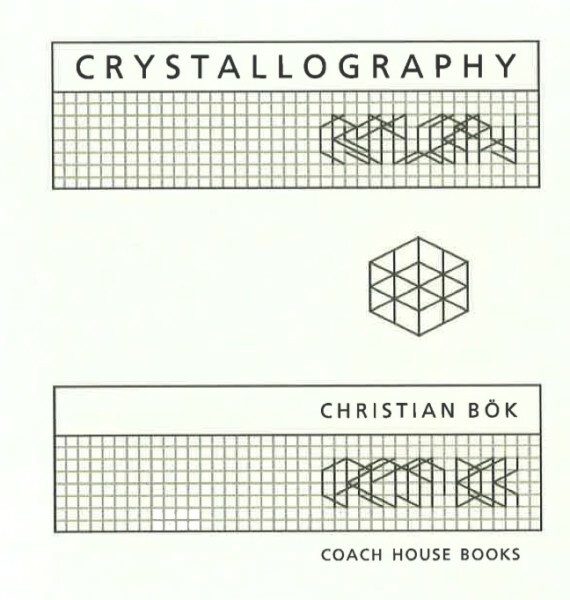 In general, in regard to images, Crystallography makes it possible to conceive a book that might do what this one does—take an existing technical discourse (a “controlled vocabulary,” as Tan Lin says), and bend it to a poetics (a “pataphysics,” to adopt the concept Bök has studied)—but do it more extensively, bringing not just a images but parts, properties, and meanings of images into the play of writing. The conceptual project. 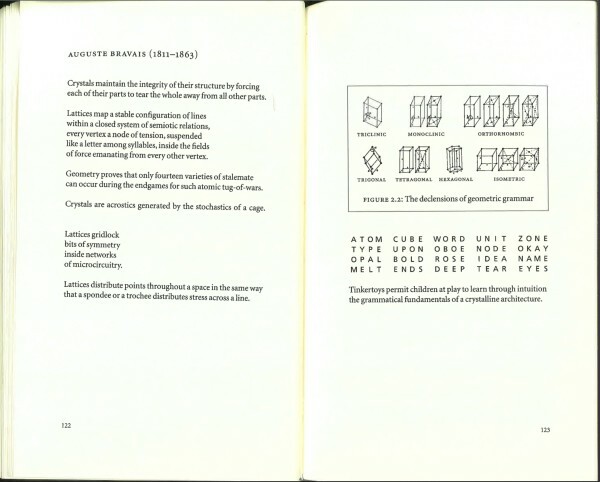 This book is “an introduction” to the “conceptual groundwork” of a real-life project, which is a poem encoded in DNA in a bacterium, and another poem that is produced when that poem is read and translated by the bacterium’s cells into a protein. 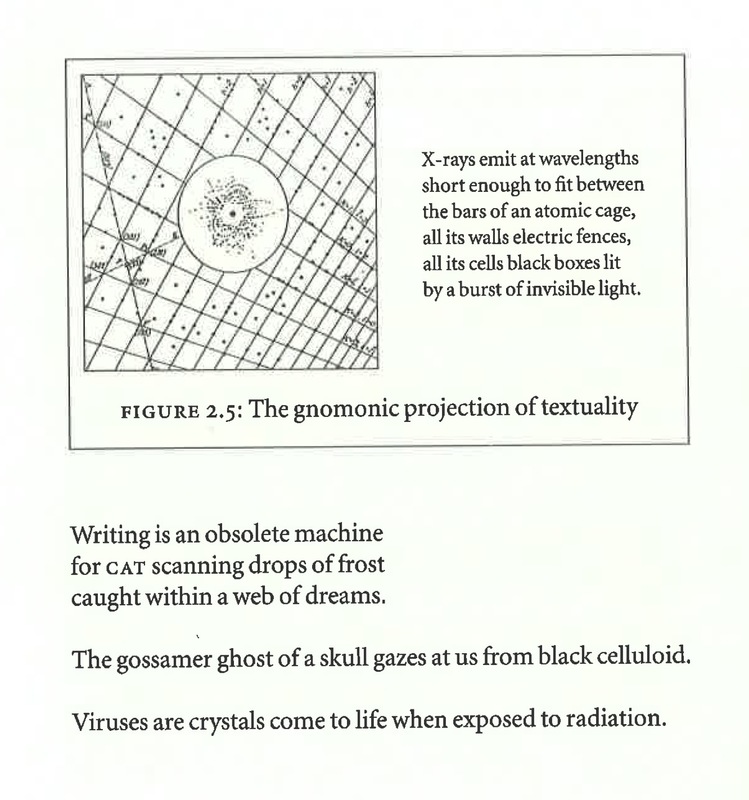 Presumably those actual poems, or the sum total of genetically modified bacteria, comprise “Book 2.” In this sense the images in The Xenotext are motivated differently from those in Crystallography. Both are “aesthetic” projects (the word Bök uses), but The Xenotext is explicitly an introduction to something that exists elsewhere, outside of books and even of human agency. That gives the images in The Xenotext a significance that images don’t have in any other work of fiction that I know: they point to real-world correlates in the way that scientific images ordinarily do. Questions of design. 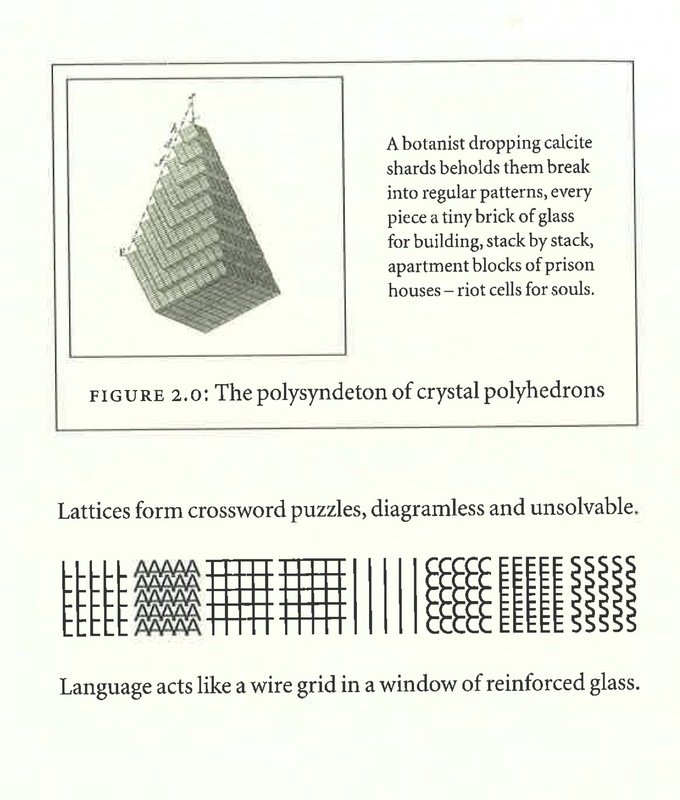 The graphics in The Xenotext are also more crafted, more polished and well-presented, than those in Crystallography. 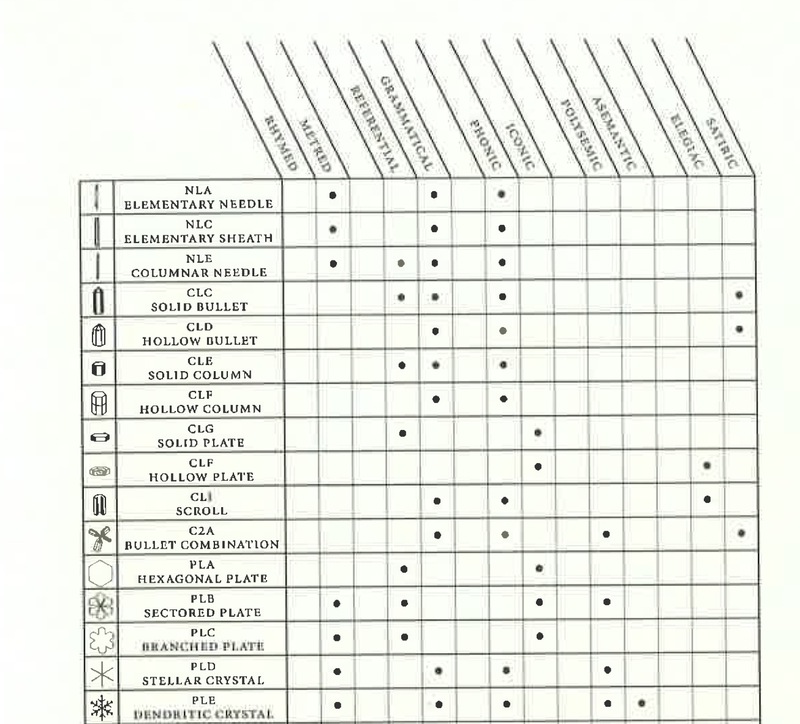 Their professionalism is partly an artifact of the professional chemist’s software that produces them: the ribbon diagrams and charge envelopes on pp. 105-12 are straight from the professional software. (Bök advertises that they were drawn with a supercomputer, but the graphics themselves, without the computing tasks he set, are routinely drawn on personal computers.) In other cases he has chosen fonts, line strengths, and spacing to make diagrams that are both professional-looking and designed. The result is that the QR codes and Conway’s “Life” game cells match well with the diagrams of amino acids (pp. 117, 118), which match well with the star chart that ends the book (p. 147). In Crystallography, some images seemed done on Bök’s own personal computer, others were collaged, and still others were photographed from 18th and 19th century sources (or from the internet). There is no such heterogeneity here. I mention this because the uniformity and care of the images in The Xenotext brings real, professional science into the book in a way that the poetic text does not. There is real genetics and laboratory work behind The Xenotext, but the poems and prose are highly inflected by Bök’s poetics. The images, by default, are what remain to represent genetic science. (There are minor exceptions, such as the chemical formulae in footnotes on pp. 118-37.) 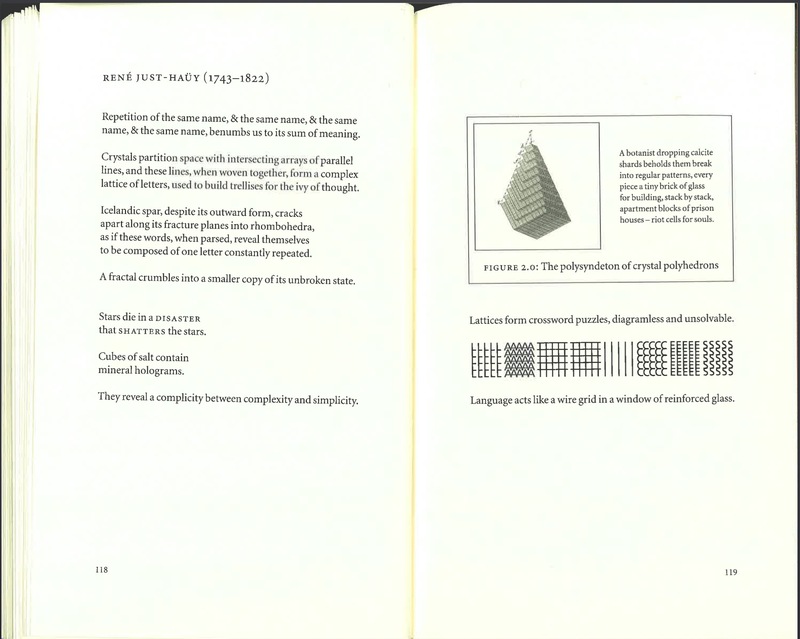 So both in terms of the book’s conceptual (and post-human) project as “living poetry,” and also in terms of the book’s design, the illustrations work as signifiers of science. 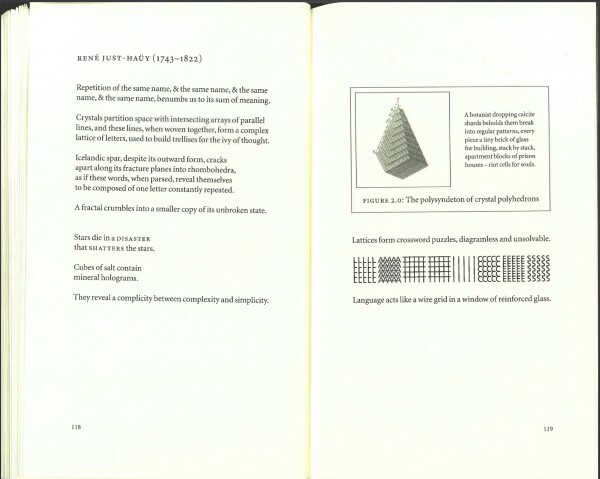 The dialogic relation of images, diagrams, text. Throughout this Writing with Images project, I’ve been interested in the possibility that visual material might request or require the same amount of attention as text, so images would not function only as illustrations, examples, or ornaments, but would drive, inform, and otherwise direct the reading (This is theorized in Chapter 5.) Very few writers do this, Sebald and other prominent examples includes. The Xenotext comes the closest of any of the texts I’ve seen to accomplishing such an equality of images, diagrams, and writing. (1) background (p. 154), (2) description (p. 98), (3) diagram of the gene (p. 81), (4) diagram of the nucleotide molecule (p. 99; this is the least helpful or pertinent), (5) the poem itself (pp. 100-2), (6) the codons that produce the amino acids (p. 103), (7) the computer-generated images of the resulting protein (pp. 105-8), together with (8) their key (p. 104). Of these pages, only three are text. Four are colored printouts, two are line drawings, and four are formatted text. It’s the most complete integration of images and text I know, provided a reader is trying actively to follow the transcription process. If not, it probably disintegrates by stages into a reading of the poem and a glance at the other pages. The book’s style and tone. The pictures are products of contemporary science, and the graphics are carefully tailored to be uniform and professional-looking. 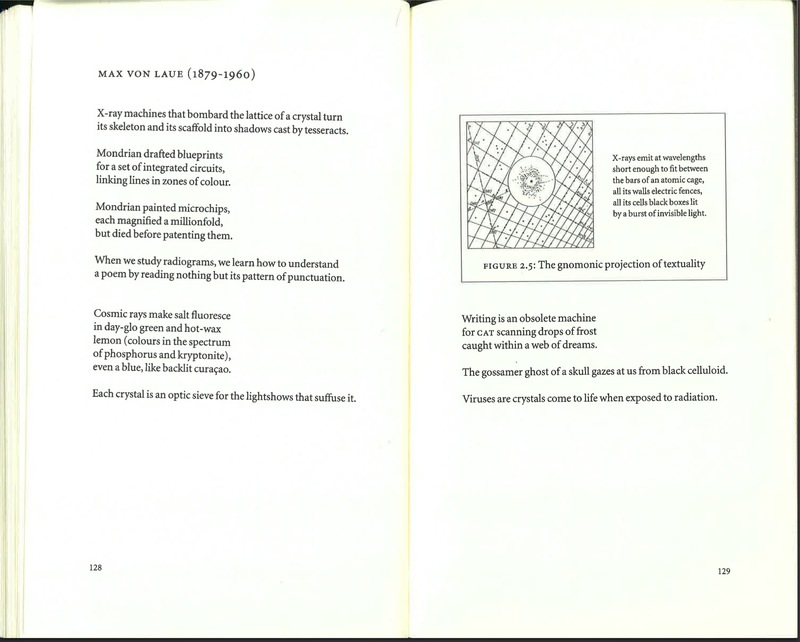 By contrast, much of the book’s poetry is very idiosyncratic, and it varies widely. It isn’t possible, I think, to agree with reviewers who say things like “his poems echo the strains of the ancients,” or “already these poems feel eternal, as if they’ve been with us since Virgil, since Homer.” The poetry is intentionally cosmic, portentous, and grandiose. Much is written in what Quintilian and Cicero called the “grand” and “ornate” style. But it isn’t at all simply “ancient” or “heroic” in the unironic manner of Virgil or Homer. (1) Those provided by the conventional labeling in biochemistry: words beginning with “O,” for example, when it is necessary to signify Oxygen; or words ending in A, T, G, or C when it is necessary to signify nucleotides (pp. 100-2). (2) Those provided by poetics: the virelay, the lipogram, the acrostic, the grimoire, and so forth. (3) Those added by Bök to echo or elaborate (1) or (2): for example the limitation, in some poems, to words of exactly nine letters (pp. 86-95, 100-2). I think this self-imposed restriction, which he announces on p. 154, is intended to produce a harmony with the three-letter codons (in relation to pp. 100-2) — although of course the steps of the DNA ladder aren’t nine units across. These molecular, poetic, and aesthetic constraints produce produce a constantly unpredictable shifting series of warps that cannot easily be assigned to a single voice. The awkwardnesses warp the intended tone, as it does in the English translation of Perec’s La Disparition (A Void), which sounds sometimes like a mockery of 18th century prose, and other times like a tin-eared attempt to mimic some regional accent or creole. Those unpredictable effects are saving graces. Otherwise The Xenotext would be overrun by its author’s grandiosity. 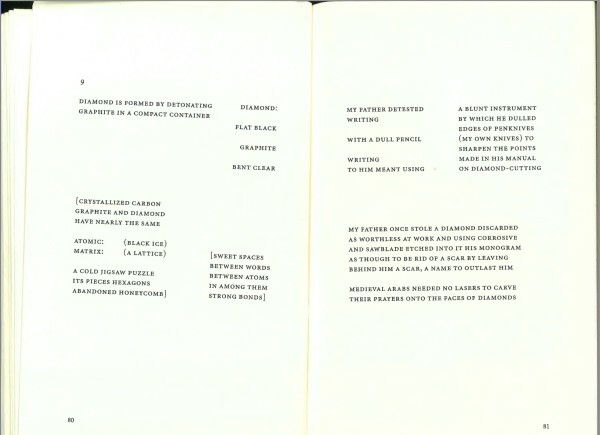 I especially like the weird repetitions he forces himself into in “The Virelay of the Amino Acids,” where he gives himself the task of writing a poem for each of the amino acids, restricting himself to words that begin with the letters of the atoms (Carbon, Nitrogen, etc.). What is weird, and effective, is that there’s no reason why the words couldn’t have been more varied (many words begin with “C” and “N”) but he chooses repetitions at the same time as he imposes repetitions on himself. The result is a language that tries to be both “grand” and “ornate” and is continuously hobbled. It is very effective, especially as a contrast to the uniformity and contemporaneity of the images. Postscript on Bök’s politics. 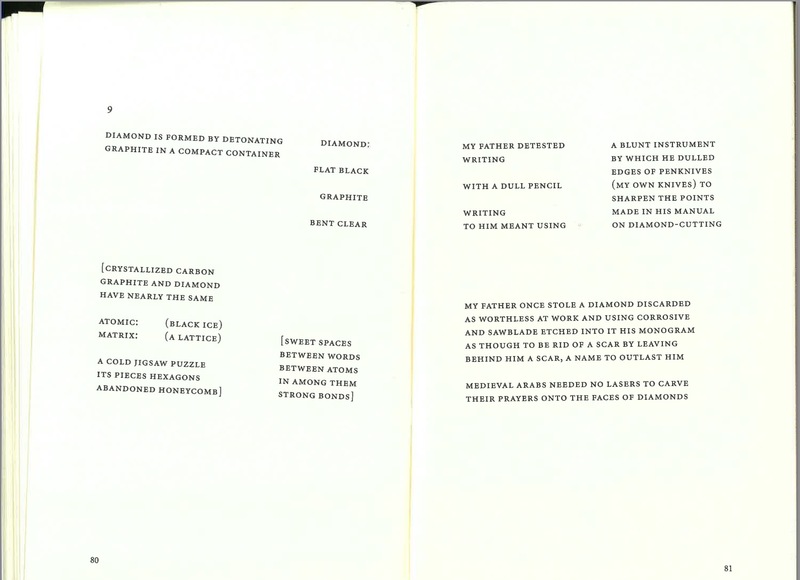 The Xenotext is dense, highly worked, genuinely eccentric, and memorable, and it would be a pity if the author’s politics (his blocking of people associated with the Mongrel Coalition Against Gringpo), or the endorsement by Marjorie Perloff (“one of the most beautiful poems of our time”), prevents readers from engaging with it.